So I’ve had this Blynk project online for a while now. It’s battery powered on an ESP8266, and wakes up every 15 mins to update Blynk. I also want to know if the battery runs flat or there’s a problem, so I’ve got notifications turned on when hardware goes offline, but after an ignore period of 1 hour so that it’s missed 4 updates before alerting me. It’s been working fine that way for a couple of months, but yesterday it started sending offline notifications every time that the device went offline after the 15 minute period, so it looks like it was ignoring the 1 hour period. It’s also updating Blynk with the correct data every 15 mins, so the sketch, wifi etc appears fine. The offline indicator on the project shows the device is offline, but the “since” is never more than 15 minutes old, so that matches the expected timing from the sketch sleep function. There’s also a LED on the sensor I’m using which it turned on via one of the ESP pins, and I can see it turning on every 15 mins. Just in case, I took the device off battery and put it onto a DC power source with the same problem. 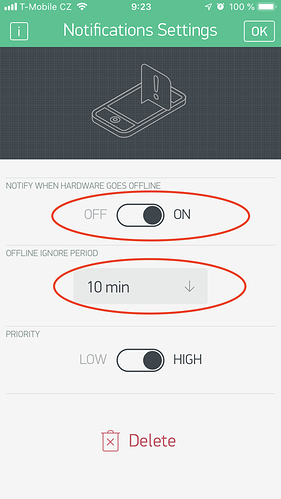 Notification setting for the project is Notify When Hardware Goes Offline: On. Offline Ignore period: 1hr. Priority: Low. Has anything changed with the Blynk cloud servers that would cause this behaviour? I’m using the latest version of the iOS App - 2.25.0 (3) on Blynk Cloud. Edit: the sketch hasn’t been updated for at least 3 weeks, so it’s not tied to any change to sketch, Blynk library versions etc. Same for me. Since yesterday (10th March 2018), notifications behave strangely. I change nothing in my device code or in Blynk mobile app, so it must be something on the Blynk part. The offline notification comes after each disconnection of the device from Blynk/internet (every 5 minutes), even if the Offline ignore limit is set to 10 minutes…I am using latest version of mobile app and Blynk library. Hello. Yeap. Seems like issue introduced with the latest deploy. I’ll ckeck. @Alan_1 could you please verify it is fixed now? I think it’s okay, there have been no unexpected notifications in the last two hours…Thank you. that’s much better now. Thanks for sorting this out so quickly, great customer support!